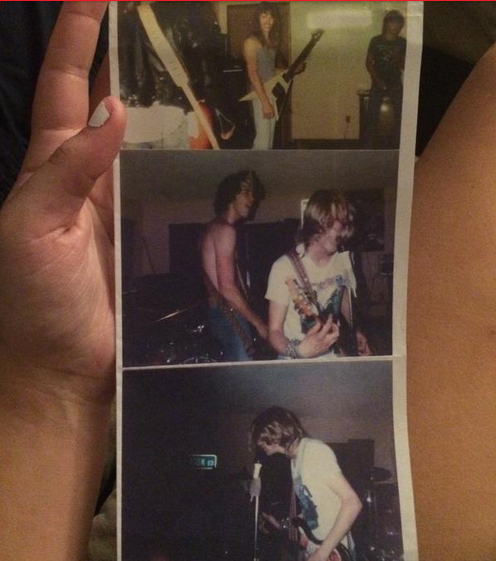 A teenager has found a set of photos from the very first Nirvana show, all the way back in 1987. Maggie Poukkula, who's 19, is the daughter of musician Tony who played with Kurt during the formative days of the band that went on to become Nirvana. She found the pictures tucked away in a copy of a book about the iconic frontman and Tweeted them out saying: "Pictures of my dad and Kurt Cobain playing together back in the day". Fans quickly cottoned on that this was a major discovery and may even depict the very first Nirvana show, from back in 1987. QUIZ: HOW WELL DO YOU KNOW YOUR NIRVANA LYRICS?